How many times have you told your early-bird spouse, annoying kids, pesky co-workers, or irritating mother-in-law "Don't talk to me until I've had my coffee!"... Only to have your request completely ignored and forgotten? 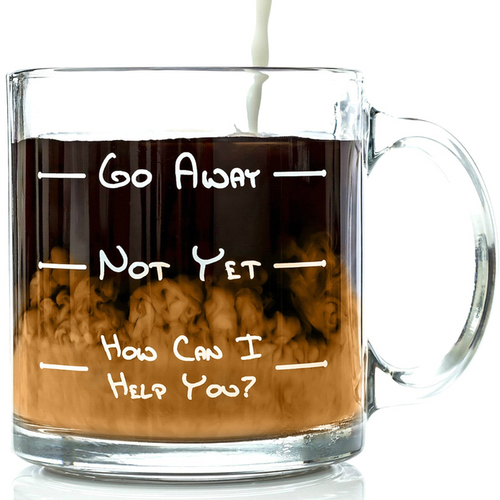 The "Go Away" Coffee mug is the perfect way to show people just how NOT ready you are to start the morning. One glance at this full coffee mug lets everyone know they should just 'Go Away' and come back much, much later. The "Go Away" Coffee mug sports vivid and highly readable text that can be seen from all corners of the home (and office too!). Each mug is 100% dishwasher safe and certain to last even the roughest of caffeine induced, stress-filled mornings. The solid glass mug has a notable 'heft' when held, and has a quality feel like no other cup in your cabinet. This is not your standard tourist-trap ceramic mug! Each glass is manufactured in the U.S.A and is quality checked to a much higher standard than the mugs you've encountered in the past. This mug will last for years to come. Everyone deserves the opportunity for a bit of peace and quiet during their coffee time. This hilarious mug makes a great Christmas gift for Dad, a cool birthday gift for men and woman alike, and a perfect gag gift for office parties and wedding parties. Each mug ships safely in an attractive box and is ready for gifting right away! We guarantee the safe arrival of every glass, every time ... or your money back. Don't be intimidated by other glasses you may have ordered in the past that arrived chipped or broken - We've gone to great lengths to make sure even the bumpiest of shipping trucks can't break our glasses!